Also known as "La rue"
"This award-winning animation film spares no feelings and minces no words. A poignant interpretation of a short story by Montréal author Mordecai Richler, it makes what is sometimes an embarrassingly frank statement about how many families respond to their old and infirm members. 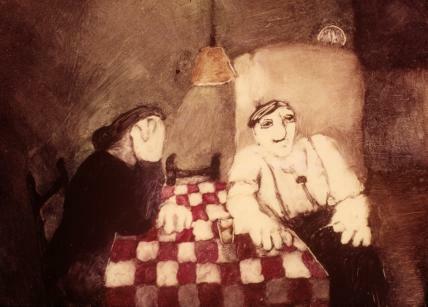 In soft simple washes of watercolor and ink, the filmmaker interprets reactions to a dying grandmother, capturing family feelings and distilling them into harsh reality." "While dealing with the timeless theme of aging, infirmity, and death as seen through the innocent eyes of children, the animation also exudes the warmth and sometimes self-deprecating humour of first-generation Jewish urbanites. Leaf's animation technique of continually changing washes of water-colour and ink on a glass plate created an almost cryptic rhythm of object-blending-into-object, beyond the earthbound rules of fixed observation." "Another film rich in hesitation/lapse is Caroline Leaf's The Street [...] Leaf often uses the hesitation as cross dissolve, from neighbors' bodies to building; or as fly-throughs before the age of computer, dissolving paint in the path of children running down the street." "The tone of Mordecai Richler's story of life in the St. Urbain Street district of Montreal, a combination of sentimentality and pungent, accurately remembered sights and smells, is beautifully rendered in Caroline Leaf's subtle cartoon [The Street]. [..] Painted in muted browns, the film at times has a startling three-dimensional quality thanks to long 'dolly' shots which give the unbroken impression of a number of different, swooping, camera angles." "[Caroline] Leaf's rough, spontaneous application of the paint directly under the camera underscores the importance she gives to the tactility of memory. With a little tempera, some glycerine, a wooden stick, a wet cloth and her fingers, she conjures up a universe on a piece of opaque glass. The roughness of her gestures contributes greatly to the presence of the memories, to making it seem as though the child whose story we are hearing painted these images himself." "In one especially touching moment of epiphany, the mother's daily work is epitomized by the swirling gesture of her hands. Circling through the son's memory, his mother's hand's dance from swirling cake batter in a bowl, to combing his hair, to washing the floor, to wringing out the rag, back to mixing the batter -- all in one continuous fluid motion that links the activities in an endless, tireless stream of work." "The Street, perhaps Leaf's most celebrated animation, features images created using under-lit ink on glass, with individual frames generated by small changes to the previous one. This technique, combined with the narrative, produces two senses of space. The first is one of enclosure, while the second is one of transformation. The contrast between these creates the particular spatial dynamics of the animation, where being held in abeyance while waiting for a death in the family has to give way in the end to that inevitable change." "Les dessins profitent d'une vieille technique qui consiste à ajouter de la glycérine à la peinture, ce qui l'empêche de sécher. [Caroline] Leaf peut ainsi faire bouger la peinture comme elle déplacerait du sable. Cela accroît la fluidité des mouvements, d'autant plus qu'elle apporte un soin minutieux aux raccords entre les plans et au développement des métamorphoses elles-mêmes." "Plusieurs anamorphoses (distorsion, étirement de l'image) complexifient les qualités picturales inhérentes à ce travail profondément impressionné par les images de la nouvelle de [Mordecai] Richler. De fréquents gros plans sur des parties du corps et des objets signalent l'importance de la métonymie dans ce cinéma : une main enroulant une balle de laine, une main d'enfant lançant une balle de baseball. Les mains jointes sur la poitrine de la grand-mère endormie..."
Schenkel, Thelma. "Storytelling as Remembering: Picturing the Past in Caroline Leaf's The Street." In Storytelling in Animation: An Anthology, edited by John Canemaker, 41-50. The Art of the Animated Image, vol. 2. Los Angeles: American Film Institute, 1988. 'Published in conjunction with the Second Annual Walter Lang Conference on Animation, held on June 11, 1988'. Wood, Aylish. "Re-animating space." Animation 1, no. 2 (2006): 133-152. Blumer, Ron. "The Street." Review of The Street. Cinema Canada, October 1976. Pym, John. "The Street." Review of The Street. Monthly Film Bulletin, March 1978. National Film Board of Canada. "NFB -- The Street." National Film Board of Canada. http://nfb.ca/trouverunfilm/fichefilm.php?id=10524&v=h&lg=en&exp=.